Chanteur Country US né le 20 Mai 1985 à Dixon (Californie). Country singer and sonoriser Jon Pardi, born May 20, 1985, and raised in Dixon, California, discovered his love of country music early, thanks in no small part to his grandfather's country karaoke machine. Falling under the spell of traditional country artists like George Jones and George Strait, and with a special affinity for Hank Williams Jr., Pardi was playing guitar as a child, and was only seven years old when he belted out "Friends in Low Places" at his father's 30th birthday party at a local hall. He was 12 when he started writing his own songs, and joined his first band at the age of 14. 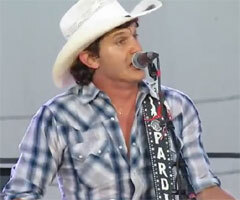 Country music was the only thing Pardi really wanted to do. He formed a duo with friend Chase McGrew after he graduated from high school, and the pair began playing the regional clubs and bars. Pardi and McGrew moved to Chico together to attend Butte Junior College, and for the next three years played in a local band called Northern Comfort. Pardi always knew he had to end up in Nashville, the home of country music, in order to fulfill his dream, and he moved there in 2008 when he was 23. He supported himself initially as a lifeguard, but he had developed into a natural narrative songwriter, and landed a publishing deal just 18 months after arriving in Music City. The publishing deal led to a lot of well-connected co-writing for Pardi, and he honed his writing skills even more, usually singing his own demos of the songs to shop around. His name got frequently noticed and recalled, and following a showcase gig with his band, Pardi signed a recording deal with Capitol Records Nashville. Using friend and collaborator Bart Butler as producer (Butler had handled most of Pardi's demo sessions), he began recording his debut album. A first single from the project, "Missin' You Crazy," was released in the spring of 2012, with the album itself, Write You a Song, finally arriving early in 2014. It peaked at number three on the country albums chart, and rose to number 14 on the Top 200 listings. In 2015, Pardi began work on his second album, and a track from the project, "Head Over Boots," became another hit, going to number 19 on the country singles chart. Pardi's sophomore album, California Sunrise, appeared in June 2016.